FINALIST FOR THE PEN/FAULKNER AWARD FOR FICTION LONGLISTED FOR THE DYLAN THOMAS PRIZE A breathtaking, suspenseful search for the truth of one man's spectacular downfall, from Daniel Alarcon, one of the New Yorker's 20 best writers under 40. Nelson's life is not turning out the way he hoped. His girlfriend is sleeping with another man, his brother has left their South American country and moved to the United States, leaving Nelson to care for their widowed mother, and his acting career can't seem to get off the ground. That is, until he lands a starring role in a touring revival of The Idiot President, a legendary play by Nelson's hero, Henry Nunez, leader of the storied guerrilla theatre troupe Diciembre. And that's when the real trouble begins. The tour takes Nelson out of the shelter of the city and across a landscape he's never seen, which still bears the scars of the civil war. With each performance, Nelson grows closer to his fellow actors, becoming hopelessly entangled in their complicated lives, until, during one memorable performance, a long-buried betrayal surfaces to force the troupe into chaos. Nelson's fate is slowly revealed through the investigation of the narrator, a young man obsessed with Nelson's story-and perhaps closer to it than he lets on. 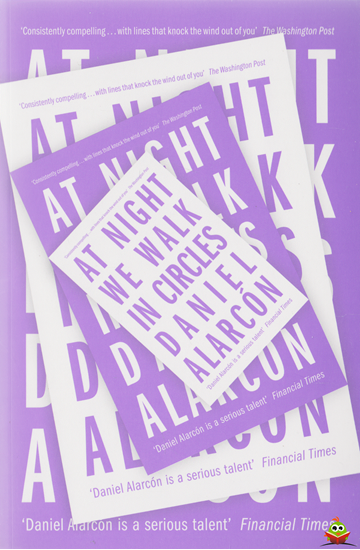 In sharp, vivid, and beautiful prose, Alarcon delivers a compulsively readable narrative and a provocative meditation on fate, identity, and the large consequences that can result from even our smallest choices.